The most popular places in Portugal are Lisbon, Sintra and the beaches of the Algarve. You’ll find lots of beautiful locations in these popular places. Additionally, in the smaller and lesser visited towns you’ll find some hidden Portugal Instagram spots! Looking over to Pena Palace from the Castle of the Moors, Sintra. You must visit the Castle of the Moors in Sintra. From this location you’ll get 2 Portugal Instagram spots in one shot. Not only do you get the Pena Palace in this shot but you also get the steps of the Castle of the Moors. An incredible set of stairs and the red facade of Pena Palace will get you likes on Instagram. Most pictures you see of the palace will be of the yellow facade. However, the yellow facade is perfect for the Instagram girls (or boys) to model in front of! This picture was taken from the Castle of the Moors looking towards Pena Palace. These are part of the UNESCO area of Sintra. I took this photograph with a fish eye lens. If you use a bridge camera or lens with good zoom you’ll get a rare close up of the red facade of Pena Palace. Last night’s golden hour in the Eastern Algarve, Portugal. In Portugal the sky is almost always clear and a sunset is guaranteed. I was visiting a small town in the hills of the Algarve for some cake and a coffee. I was gifted with this popcorn sky. You don’t need an amazing camera to make a shot like this, the sky does it for you. Nothing gets likes on Instagram like a good sunset shot! The sunset shot was taken from Santa Catarina which is a small village in the Eastern Algarve. I took it with a Canon bridge camera. The streets of Sintra, Portugal. The traditional cobbled streets of Portugal photograph well for Instagram. I was up late to find an empty street in the Portugal Instagram spot of Sintra. If you visit lesser know villages you’ll find lots of empty and picturesque cobbled streets. If it rains (which is not often in Portugal) the cobbles become shiny. When the cobbles are wet they become shiny. As a result you’ll be able to make some unique reflection shots with them. The Streets of Sintra photograph was taken using a fisheye lens late at night in Sintra village. Colourful houses in the UNESCO historic city of Porto, Portugal. The colorful houses are one of the most Instagrammable places in Porto. Additionally, I have found that photos of colorful houses always get more likes on Instagram. In the UNESCO historic city of Porto there are thousands of colorful houses waiting to be photographed. Those who like to make poses in front of them will love searching for Porto Instagram spots. Another bonus of this city is that in front of the colorful houses is the Douro river. The Douro river is lined with colorful port boats which are full of barrels of port. Furthermore, you can also take a boat tour giving incredible views of the historic city and views of several Porto Instagram spots. This shot was taken from Vila Nova de Gaia looking over to the colorful houses. I used a Canon bridge camera and zoomed in. You’ll see lots of buildings in Portugal covered in light blue tiles. As a matter of fact these tiles are known as azulejos in Portuguese. You’re guaranteed to see azulejos everywhere. The more you see and read about them, the more interesting they’ll become. Any small Portuguese village will have houses covered in azulejos. A famous Instagram spot in Porto to make Instagram poses in front of are the azulejos of Carmo and Carmelitas Church. 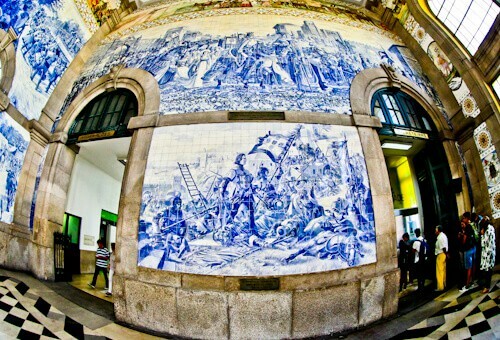 This shot was taken from the interior of Sao Bento train station in the center of Porto. It was taken with a fisheye lens. 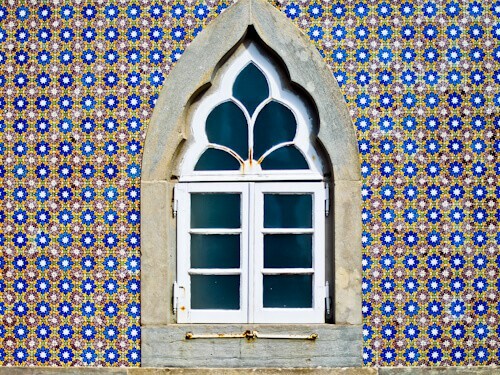 If you pay attention to the doorways and windows in any Portuguese village you’ll come across some very unique designs. If you like this type of photography then you’ll need a decent sized memory stick as you’ll be taking lots of photos! Moreover, you’ll find lots of Portugal Instagram spots with the archways as a backdrop. Gustave Eiffel is one of the biggest names in architecture. You’ll be thinking of his masterpiece in Paris, the Eiffel Tower. 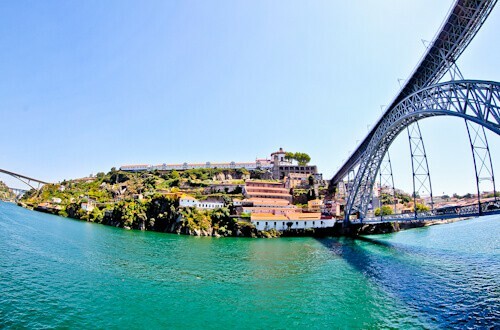 He has designed a bridge in Porto called the Maria Pia Bridge. There is also an elevator in Lisbon and a 2 story bridge in Porto that were designed by his students. If his masterpiece in Paris is Instagrammable then his other pieces around the world are too. This photo was taken from the banks of the Douro river with a fish eye. On the far left is the bridge designed by Gustave Eiffel. Definitely make time to visit the smaller towns and villages of Portugal. You’ll be gifted with incredible views you’ve never even seen on Instagram. 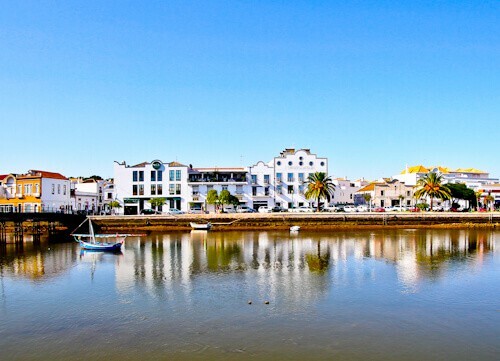 Tavira is a small town in the Eastern Algarve which offers all that the major cities do but without the crowds. Foodies will love Tavira too, there are plenty of dining options. This reflection photograph was taken from the main plaza of Tavira. I took this with a fisheye lens. Where else can you get a picture of the most western point of continental Europe? You could argue that the continental divide is in Iceland but that’s not part of the mainland. There is a marker stating the fact that this is the western most point of the mainland. This marker is perfect for those Instagram poses. This picture was taken from the Cabo da Roca marker looking towards the light house. The beaches of the Algarve are beautiful. You’ll find endless perfect beaches. Barril beach in Tavira is separated from the mainland. You need to take a train to get to the beach. As you make your way to the beach you’ll pass several anchors. One side of the anchors are restaurants and the other side is the beautiful beach. There are other parts where of the Algarve where you must take a boat to the beach. Because the beaches are separated from the mainland it makes them unique and Instagrammable. 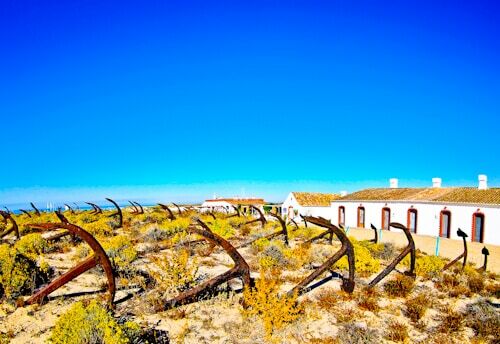 This photo of the anchors at Barril beach was taken with my fish eye lens. The 1908 Lisboa Hotel, Lisbon. There are thousands of Instagram worthy places in Lisbon. As a result you could spend hours walking around the city posing for photographs. 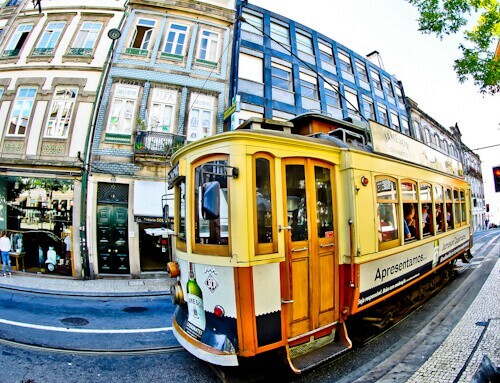 Moreover, any Instagrammable places in Lisbon with a yellow tram in front of it becomes even more Instagrammable! Examples of Instagram worthy locations in Lisbon are Belem Tower, Santa Justa Lift, Lisbon panoramic from Sao Jorge Castle, Commerce Square as well as several colorful houses and trams. Furthermore, read more about the Lisbon Instagram spots. Enjoy searching for Portugal Instagram Spots! 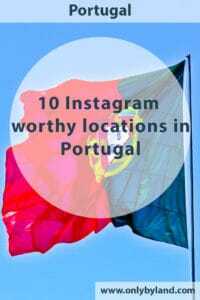 Enjoy taking photos of the Instagram worthy locations of Portugal. Keep your eyes open as there are beautiful things everywhere to photograph. Always have your camera ready as you never know when a great Instagrammable opportunity will come your way. What to see and photograph in Porto and Sintra. I have this notion that Portugal is over-shadowed by Spain. It’s a shame because Portugal is a must-visit in its own right, as shown by this list of beautiful locations! Porto has me intrigued especially as many bloggers have talked about visiting it. I love the Castle of the Moors and the cobbled stone streets as well. I’m a huge Portugal lover, so thank you for bringing these other places to my attention. 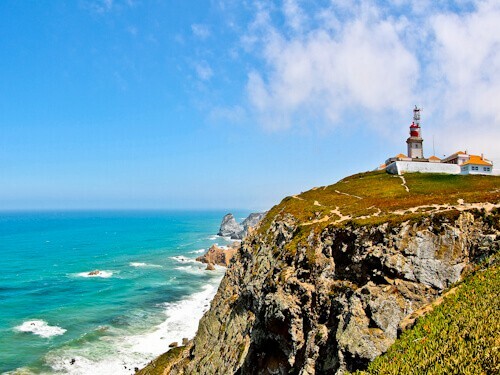 I’d love to see the end of Europe at Cabo da Roca, and your shot of the popcorn sky, just mesmerising! I’d like to return and explore more of the south; the north really is one of my places in Europe, it put a big smile on my face to see the Douro river! While these places are instagrammable, I’d love to have the memories to myself. Portugal is so beautiful and I’ve never seen this side of the city. Perhaps, it’s your shots. I wonder how it would feel if I walk around and find azulejos around me. I’d be so shocked if I hadn’t read about it. A trip to Portugal can never be boring. I love the Moorish style, there is a lot of it in Morocco. Those stairs in the first photo look familiar, I think those are the same stairs that are in Game of Thrones right? I’m a huge GOT fan 🙂 I may be going to Portugal this year, so this is going to be a great resource! The streets are architecture have so much personality! They’re so full of color, patterns, and truly are an Instagrammer’s dream come true. I can’t wait to go check out these places for myself someday! I love posts like this that tell you where to take the best photos. I wish I had seen this before I actually visited Portugal! I did take lots of photos of all those gorgeous tiles and archways and doors and windows, though. They are so beautiful. I will have to agree, these spots are truly Instagram worthy and just photogenic in general. I would love to snap up some photos in these amazing streets and landscape.s the Mediterranean truly has some gems. I have seen so many beautiful pictures of Portugal lately! Especially Porto, it is a photographer’s dream! Thank you for sharing the exact location where you take these shots from. Portugal sure is gorgeous. I loved the picture of Sintra. Which lens did you use while clicking it? The houses of Porto are so perfect. Didn’t know it’s a UNESCO historic city. I am someone who loves to get lost in the narrow lanes of cobbled streets of any destination. The whole list of photo worthy places are added to my list of places to visit whenever I visit Portugal. I am in so much love with colorful town of Portuguese named Porto. Thanks for the list. Wow, such great photos! I’m going to Portugal for the first time in a few weeks and will be going to Lisbon, Sintra, Evora, and Lagos. Seeing these makes me all the more excited! Thanks for sharing them. Hi Erin, I’m sure you’ll make some amazing photos in these places! I’ve not been to Evora yet but i know the historic center of the town is a UNESCO world heritage centre, enjoy!